Transcript of Professor Bokhari' s first press conference as Under-Secretary of the United Nations ". at UN Headquarters, January 14, 1955. Ahmed S. Bokhari: Ladies and gentlemen, as you realize, I am not in a position to answer any important question. You must regard me as the poor man's Hammarskjold and must ask me extremely light and inexpensive questions. I do not know whether you would like me to give a brief sketch on which you can hang your questions or whether you would like to start off with the questions. Question: Would you give a sketch, please? Bokhari: As you know, we went over from here to London in an American military plane. We were in London about twenty-four hours and you know the people whom Mr. Hammarskjold and part of his party met in London. We left by a special chartered BOAC plane for New Delhi, stopping for about two hours in Paris, on the airfield, where Mr. Mendes-France came to meet Mr. Hammarskjold. I think we were in Delhi about twenty-four hours and then, by an Indian plane, we went from Delhi to Canton. I understand that the plane did not go over the hump but went over Burma and Thailand, and therefore made a rather difficult journey. We were dropped in Canton in the morning. It was a cold morning and the clouds were very thick. When we came down from the clouds, we saw Canton surrounded by hills and, to my layman's eye, it looked like a very difficult landing but it was done perfectly. The landscape, when we could see it, was extremely beautiful and I remember that it was described in the party as an extremely civilized landscape. We landed at Canton and were received by the Foreign Ministry representative in Canton. When we got there, I found that the Foreign Ministry has representatives in the provinces. We were taken to the city where it had been snowing for some time - rather unusual for Canton - and people all through the town were busy digging up the snow. We went to a hotel where we had lunch. There was an interpreter, and an additional interpreter, a young girl who knew English reasonably well, was also brought to join the party. She must have been a high school girl. The interpreter that was with the party seemed to be a professional interpreter. We had lunch there and we took the plane again, this time a Chinese plane, which brought us to Hankow where we stopped for the night. Hankow is one of the three towns which all together, are known as Wu Han. We stopped at one of these towns, we crossed the Yangtse River and went to Hankow where we were lodged in a hotel. We left the next morning by the Chinese plane and arrived in Peking. According to me, it was very near the North Pole, it was so cold. There we were received at the airfield by the whole diplomatic corps. The temperature was, I think, 10 to 15 degrees below zero. This is a purely meteorological account. I was the only person in the party that had been used to a reasonable climate. Everybody else in his weaker moments had been an Alpine climber. We arrived in the bitter cold. Of course to me the ceremony of shaking hands with all the diplomats seemed ages too long because I wanted to get into the car. Frankly, I was feeling very cold. From there we were driven to the hotel. Mr. Hammarskjold and his personal staff stayed in the Swedish and Norwegian Embassies, and the rest of us stayed in the Peking Hotel, which was very comfortable. By this arrangement of course, I also got Mr. Hammarskjold's room, which was very nice and much better perhaps than I otherwise deserved. That afternoon, I think, we made a formal call on Mr. Chou En-lai in the room where the meetings subsequently were to be held, which was a room of Chinese architecture, traditional and part, we were told, of the old palace. The building itself, very happily, was called "The Hall of the Western Flowers." We found this out later on. We were most cordially received. I think the conversation was very general and, of course, casual and relaxed. Before we came away, we were invited to a reception which was held that evening in "The Hall of the Purple Light", after which Mr. Hammarskjold, I think, went to dinner with the Foreign Minister. Of that dinner I cannot tell you anything because I was not there. That was the first day. After the conversation started, we met in this room every day at about 3 o'clock and generally dispersed between 5 and 6, although one day we left at 8: 10. That was the longest meeting we had, five hours and ten minutes. During the course of the talks - you will one day see the photograph - Mr. Hammarskjold and Mr. Chou En-lai sat in the middle, with the two teams flanked on either side. You know the team on this side; on the other side there was an adviser to the Foreign Ministry, the Vice-Foreign Minister, the Assistant Minister and the director of the conference organization. I am not getting the names right, but the sense of it is right. Of course, Mr. Chou's interpreter was Chinese, a very competent interpreter. He told us in one of the relaxed moments in the conference that he was a Harvard graduate, although his English was not particularly trans-Atlantic. Every day, in the course of the meeting, we were served with tea three times. I had more time to count these bouts of tea than my chief who was very busy and did not know sometimes whether he was drinking out of the present bout or the previous one. This was served, of course, in tall Chinese cups with lids on. It was Chinese tea, and very light tea. With the third round we also had some Chinese cookies. By that time we thoroughly enjoyed them because we were hungry. There was generally no interruption. Neither the tea nor the cookies interrupted the conversations at all, except one day when, I think, there was a slight relaxation for about five minutes. Otherwise the conversations were, so far as I could see, intense, earnest and continuous. Of course, sometimes a whole speech was delivered before it was translated, and sometimes it was cut up into parts. But the whole atmosphere was of great earnestness. There was not a sound, not a noise of any kind in the whole room. The servant that came in was of course, dressed exactly like the Foreign Minister. Everybody in China seemed to be dressed exactly alike because they were all in blue. There was a coat buttoned up to the neck, jacket and pair of trousers either cotton quilted or serge woolen. I was told that because of the winter and this being the commonest cloth, blue is so much in evidence, but that in the summer more colours would be seen. This went on day after day except for Sunday. I think that one day in between the party was taken to see an opera. I did not go because I was dining in my own Embassy on that evening. On a Sunday the party was taken to the Summer Palace and the Ming Tombs. On the day previous we were taken to the Forbidden City which stretched for so many miles that I could not finish it. So I stopped at the first halt where, in a small room, there was a stove and some tea. On these occasions about the worst person in the world to follow is Mr. Hammarskjold, because he walked at a terrific pace without a hat - which was uncommon in China - and faster than anybody else. Air travel suits him. I asked him one day why he was so full of energy after turning out of an airplane. He said that he is a modern man used to these modern methods of transport. Since that time I am waiting for him to jump out of a rickshaw one of these days. On the last night we had dinner with the Prime Minister. We came away next morning in a Chinese plane, which brought us to Canton, and then in a Chinese special train to Sungching, which is a border town between the mainland of China and Hong Kong. Then a Hong Kong train took us over to Kowloon, and then to the island of Hong Kong where we stayed the night, and next morning took a Scandinavian plane to Tokyo. Within a matter of minutes we changed from the Scandinavian plane to the American military plane, which brought us, eventually, to New York. That "eventually" is very carefully put there, because we had a short halt at Honolulu. There was also a short halt at Reno on the way, but that was in the dead of night; I was asleep and suddenly felt the aeroplane grow cold. It was not because of the entry of Mr. Foote and Mr. Cordier but because a door had been opened. We took off again and arrived in New York at a time which, frankly, everyone of you knows more than I do because I was whirled into the outskirts of the crowd and, leaving my Chief to his fate, or rather, to his destiny, I took a cab and went home. That, I think, is enough for you to hang your questions on, should you care to. If you find any political overtones in what I said, ignore them; they are incidental. Question:Mr. Bokhari, at the dinner which you attended, or at any of the functions there, could you tell us if any toasts were proposed, and, if so, what they were? Bokhari: I think there was only one dinner at which toasts were proposed; as a matter of fact, I went to only one dinner, which was on the last day. I do not exactly remember the toasts, but certainly one was proposed to the Secretary-General, and a toast in response was certainly proposed to Mr. Chou En-lai. I think there were one or two other toasts, but I am not specific about them. They were of a generally courteous and genial nature, but there is nothing in particular that I can tell you about them. I do not even remember about them - and that is not because I was in no fit condition to remember. There was nothing particularly significant that struck me; they were just the courteous, genial toasts you expect at such moments of hospitality. Question: Were they in Chinese wine? Bokhari: Yes. Of course, a Chinese dinner is an unending business. I considered myself a fair addict of Chinese food on Second Avenue and other places like that, but I do not propose to go there - except both in anger and in sorrow when I go next. Somebody has put before me a Chinese menu which I should very much like to read to you. This was the menu at the last dinner. Would you like me to read it? It will take hours. It begins with the hors-d'oeuvres, which are duck in brown sauce; slices of kidney in red oil; salted chicken; fried fish with pepper and salt; celery, cucumber and tomato. Ends the first course. Consomme of swallows' nests; shark's fin and crabmeat; green haricots in chicken fat, and bamboo shoots in pungent sauce - the operative word is "pungent" - abalone and mushrooms in brown sauce; supreme of broccoli in oyster oil; steamed Peking duck with spice; cauliflower with ham, sweet potato balls and cherries with laurel perfume syrup; pastry with steamed sweet dumplings with fried kernels - kernels is spelled with a "k". Then there is ravioli with meat, fried pastries and baked yolk pastries. In addition to that, I remember that at a lunch which we had in the Summer Palace, we had various kinds of nests - the life of the swallow must be very hard - and a most delectable dish called mandarin fish, in the form of a squirrel, ending up with lotus seed soup, which is extremely beautiful, and a dish called Mongolian samovar; you do not eat the samovar, you use it for putting various ingredients into it at the table, boiling them there and scooping out your portions. Question: Was Mao present at any of these affairs, or did you toast him or go to see him? Bokhari: No, I had no contact with him at all. I did not go to see him. They are reputed to have a very strong wine, which I did not taste, but some people met some people who had tasted it, and it was described not to be weak. Question: Did you have any occasion to stroll through the streets? Bokhari: We could have done it; some of us did, but the time was so short. We had one Sunday, on which we went to see the Summer Palace and the Ming Tomb, which is twenty-six miles out of town. The Summer Palace is some distance in a different direction; so that took up most of the day. Other days we had meetings - every afternoon beginning at 3 o'clock - and most of the morning, and sometimes part of the evening, was taken up in work of various types and studies of what had been done the evening before. Mr. Hammarskjold had already given some indication that he had important work there, which indeed he had. It had to be highly concentrated, with a few social functions thrown in - not too many, but just enough as to be necessary for the occasion - and that took up most of our time. Otherwise, one or two of us did do a little shopping when we had time, and others shopped in the usual method which is common in the Orient where the merchant comes to the house with his goods. Otherwise, we had very little time indeed. Question: Can you tell us something about the procedure of the handling of passports of the mission on arrival and departure? Was it done individually, or was there a package arrangement? Bokhari: I could not tell you. All our passports, all the way through, at every single point, were in a bundle; and we got them back in a bundle. I have not even looked at my passport yet, and I do not know whether anybody read it at all. Probably it was stamped, but they were handled in a bundle to facilitate work, and were handed back in a bundle. Question: Does Mr. Chou speak English? Bokhari: He speaks a little English; I think he can speak more than he did. How much more I cannot tell because I do not know, but in the course of the conversations he did not use English, but Chinese. Bokhari: Yes, so far as I could hear him - although I did hear him use a few English phrases. On more than one occasion he said: "See you again." Question: Could you tell us whether all the official conversation took place, so to speak, in plenary, or whether there were cases of somebody discussing some specific thing with his opposite number in the group, and also whether, in plenary, all the talking on the United Nations side was done by Mr. Hammarskjold. 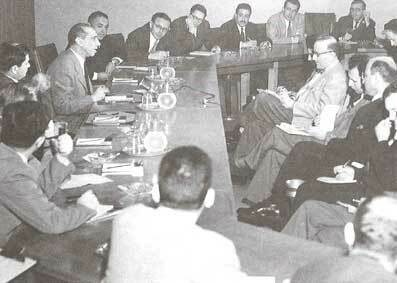 Bokhari: The conversations were conducted entirely, with the team sitting, by Mr. Chou and Mr. Hammarskjold. Everybody else was a silent listener and spectator. Question: Can you tell us something about the aspect of Peking - the life of the city, the people? Bokhari: As I told you, I did not go about much. There was very little time. I saw only the main streets through which I passed when going to the conference or coming back, and once I went to my Embassy. That was all. But there is nothing in particular that I could usefully tell you except that it seemed a very busy town: it seemed sometimes a crowded town. There were trams and buses, and a lot of buildings had been constructed all around and in the outskirts of the town. In other towns, like Canton and Hankow, of course there were shopping centres all over. Canton is an extremely busy town - an extremely crowded town. We tried to read the signs and remember symbols which were the same, and finally one of the party - I think it was a lady - began to see resemblances between some symbols on most shops, and she was clever enough to see them and to enquire and to find that these were New Year greetings which were repeated allover the place. There were other such greetings, or other slogans, perhaps, or names, but we could not read them. They looked very beautiful. Bokhari: Must you, I mean? Question: Having participated in this very important mission, are you hopeful of an early solution? Bokhari: I think that all there is to be said on that subject has been said by Mr. Hammarskjold. If there is anymore to say I am sure he will say it. Question: Did you get the impression that the people in the city of Peking were aware of your presence and knew why you were there? I am not talking about the group of officials with whom you were negotiating, but, in general, was the city aware that you were there? Bokhari: I would not say anything one way or the other, because I think it would be useless to build anything of the impression I have had. I cannot tell you. I have not talked to people, and if they had talked to me I could not have understood them. I went in a car to one place and came back in another. I do not think that I should be justified in drawing any conclusions from that. Question: What access did you have to foreign news there? Did you listen to the radio? Did you have newspapers in English, or anything like that? Bokhari: We had some papers in English, published in China, which we got. There was a radio set in one of the rooms - I think Professor Waldock's room - and I think Professor Waldock was even less efficient with machines than I am. Until the last day he went on asking me, "Does this work, do you think?" I, not having seen the radio set or been to his room, could not tell him. As a matter of fact, frankly, we were extremely busy. There were some newspapers in our rooms which we occasionally glanced at, but I suppose the bulk of the newspapers must have been in Chinese. I could not tell you. Question: I wonder if you would mind switching your scene of operations to give us a little local colour, including the temperature - and I do not mean only meteorologically - in Delhi when you arrived there: the temperature, locale, everything that happened in Delhi. Bokhari: Well, I told you that my own honest impression of the conversations and of course I understood one part of the conversation directly and the other part in translation - was of great concentration and of great earnestness. Question: I am sorry I did not make that clear. I was speaking of Delhi your arrival in Delhi, India. Bokhari: What was the atmosphere in Delhi? Question: Yes, including the temperature - not only meteorologically. Bokhari: I personally think that so far as I am concerned and I think that goes for every member of the party - we were received with the usual, and perhaps more than the usual, courtesy and hospitality. We stayed at the President's House. The evening we arrived a buffet dinner had already been arranged by the Secretary-General of the Foreign Office, and the next morning we went to Mahatma Gandhi's tomb early in the morning to lay flowers on the tomb. The whole party went there, after which we were received by the President who had then a brief conversation, I think, with Mr. Hammarskjold. Then Mr. Hammarskjold went to have a conversation with Mr. Nehru, after which most of the party was invited to Mr. Nehru's house to lunch in a very pleasant garden. Mr. Nehru was a very pleasant host. After the lunch the distinguished guests - there were two or three Ministers of the Central Cabinet, in addition to other guests and the Secretary-General of the Foreign Office, the Foreign Secretary - and I met two or three of the Cabinet Ministers who were old friends of mine. And then the distinguished guests and the host played with a pair of pandas which were there - catlike animals which had been sent to Mr. Nehru as a gift, I think from China. And very soon all were behaving like very nice, lovable pets themselves, after which I went into Mr. Nehru's house for a while to see some of his relations who had not joined the lunch because it was a stag lunch. And then, in this very pleasant atmosphere, we left. Question: Could you give us your impression - not political, of course of Mr. Chou En-lai as a person? If you were to put that impression down in a diary, what would you say? Bokhari: That is a very difficult question to answer, because I am not a diary-minded person and never keep a diary. But my general impression - and this, of course, was obtained from the conversations; I do not know anything about the rest of his life - was that he is a very alert and a very intelligent person, who knew what he was talking about and was completely aware at all times of the subject he was discussing. Question: I wonder if you have had a chance to glance through the press cuttings here. Practically all of the reports that came from New Delhi said that you had a very bad and cool reception there. You have just said - and the Secretary-General said this morning - that everything was fine. But the reports - and not just one report, but three or four - said the same thing: that you were not received well. It seems very peculiar. Bokhari: Well, in my language they tell the following story: A man was stung by a scorpion. He howled with pain. People said, "Where have you been stung?" He said, "Who would believe me? Ask the people around me." I have given you our version of the story; I cannot do anything more. Question: Had the party any contacts with the local press or other journalists in Peking? Bokhari: When we arrived in Peking, we were told that some journalists were on the way, that they had reached Canton and had got stuck. We really were rather pleased for their sake, because if they had come up there would have been no news to give them. We, therefore, thought it would be much better for them to stay in Canton, where the climate at least was not so cold. Finally, however, they managed to come up to Peking - in fact, on the last day of our visit. We were leaving the next morning. We were very pleased to see them. One of them was Spur of the Daily Express. One was a correspondent of Agence France-Presse. There was a third journalist, whose name I do not remember. I did not meet them except to say to "Hello". Mr. Hammarskjold met them for a few minutes. As you know, the only news put out from Peking were the agreed communiques, which you got like everyone else in the world. There was nothing more to give them, but we were very pleased to meet them. They seemed to take the whole adventure in very good spirit. Question: Did you meet members of the Chinese press? Bokhari: Not that I know of. Frankly, I was in a very happy position: In timidity, I would just pass every correspondent over to my friend, Mr. Per Lind, who can be trusted to do any job given to him. I should not be surprised if Mr. Lind did come across some Chinese correspondent, but I do not know. Question:Were there any women in the official Chinese delegation; that is, in the group that participated in the conversations? Bokhari: There were no women on either side, I am ashamed to say. Question: As I understand it, there was one meeting of Mr. Hammarskjold and Mr. Chou En-lai alone, and you attended the rest of the meetings. Is that correct? Bokhari: That initial contact was not a meeting except to the extent that whenever two prominent people get together, it is a meeting. On the first day of our arrival, Mr. Hammarskjold went to dinner with Mr. Chou, without the rest of the party. That is all that I can tell you. Question: Were the conversations taken down by verbatim reporters? Bokhari: So far as I know, there were no verbatim reporters present although I am sure that everyone interested kept his own notes. Question: How many hours did it take to write the last communique? Bokhari: The first few communiques were very simple. It was generally agreed that on each day the communique should merely give the facts about the meeting - the hour, and so forth. There was, therefore, no difficulty about that. The last communique, precisely because it was the very last, took a little time to draft, but there was nothing remarkable about it. Question: There was no mention of the United Nations General Assembly resolution in the last communique. Bokhari: You know where you are leading me, Mr. Keshishian. You know that better than I do. Question: On the question of the agreed release of news from the conference, could you possibly tell us how quickly that agreement was reached? I believe there was an agreement reached between Mr. Hammarskjold and Mr. Chou on the release of news each day from the talks. If you could tell us, it might be interesting to know how soon that agreement was reached? Bokhari: On the very first day. Question: How soon on the first day? Bokhari: Within a matter of a few minutes, I think. You would hardly have noticed it. Question: Were there any women in the official reception delegation? Bokhari: There were women, for example, at the official dinner. Certainly, one of them was the wife of the Assistant Minister of Foreign Affairs. Another lady was present, but I forget for the moment what her position was. Question: Were there any at the airfield reception? Bokhari: Frankly, at the airfield I was buried in my own cap and I was cold; I hardly saw anybody. I should not have been surprised if Mr. Hammarskjold had gone off in one direction and I in another. Question: Did you stay at the new Peking Hotel or the old hotel? Bokhari: I was told that the new and the old are the same; it is only an extension. We stayed in the older part of the Peking Hotel. Question: Did you dine in your rooms or in the upper or lower restaurants? Bokhari: As a matter of fact, if our business as a group delayed us, then we dined or lunched where Mr. Hammarskjold was because we could not afford the time to come away. But when we dined ourselves then we were left to ourselves. The Chinese were always very kind; they always arranged some sort of a little feast. For example, one day four or five of us were left there, and they arranged a little feast in the room and showed us a colour movie, the first colour movie in Chinese. Those of us who did stay generally dined together in a room. We did not go to the dining room. That was because we were not supposed to take the trouble of going there. Everything was brought to us as we wanted it. Question: Since we are listening to you today for the first time in your new capacity as head of the DPI, would it be all right to ask you whether you can announce to us any new changes in policy, procedure or such matters in the DPI? We are always interested in that. Bokhari:I suppose it would be all right to ask me, but I do not know the answer. Question:Was there a ceremonial or token exchange of gifts between the two delegations? Question: You spoke of a movie. Can you tell us what type of movie it was? Bokhari: It was a most harrowing love story. The details are as you might imagine. Question: Were you aware of any special security measures in connection with your visit or movements in the city and in the hotels? Bokhari: Frankly, I did not look for any. I was not aware of any. Question: Were you at any part of your journey at any time aware of any gunfire, because during your stay there and during your travels there we had some reports of some attacks at certain points? Bokhari:No, we were not aware of any. I was not aware of any. Question: Could you describe a little bit the Chinese plane in which you went from Canton to Peking? Bokhari: It was a two-engined plane. I am afraid I do not even know the name of a car until I go up and read it. Question: Do you know what type of plane it was? Bokhari: No, I have no idea. I would not be able to tell you. Question: What was the opera you did go to see? Bokhari: This was in Hankow. I do not know the name, but there were two operas that we were shown in Hankow, and they were really very beautiful. One was the story of a boy who had gone away and a girl who was in love with him and trying to follow him. She was trying to cross the river and a boatman was putting various obstacles, out of sheer mischief and fun, in her way. This opera consisted entirely of the piece where the boatman and the girl were together. He would rock the boat or not let her get on to the boat. There was no boat on the stage at all, but both of them moved in unison in one way or another. Within half an hour the most living thing in the opera was not the girl or the boatman but the river and the boat. The second opera was somewhat more sombre in theme. You do not want me to tell you the whole story. If that is all, I wish to thank you I for your patience and beg leave to retire.